Now that the identity of “A” has been revealed, will Pretty Little Liars continue to be a ratings winner for ABC Family? Only time will tell. The third season cast includes Ashley Benson, Chad Lowe, Holly Marie Combs, Ian Harding, Janel Parrish, Laura Leighton, Lucy Hale, Sasha Pieterse, Shay Mitchell, Troian Bellisario, and Tyler Blackburn. The following are the latest TV ratings for the third season of Pretty Little Liars, the best way to tell if this TV series will be cancelled or renewed for a fourth season. Pretty Little Liars typically airs on Monday nights on ABC Family and there are 24 episodes this time around. UPDATE: ABC Family has renewed the show for a fifth season. Season four will debut on June 11th. Final season averages: 1.1 rating in the 18-49 demographic with 2.59 million total viewers. 1.2 demo rating (+20% change) with 2.87 million (+19% change). Season averages: 1.10 in the demo with 2.59 million. 1.0 demo rating (-17% change) with 2.41 million (-6% change). Season averages: 1.10 in the demo with 2.58 million. 1.2 demo rating (0% change) with 2.56 million (-6% change). 1.2 demo rating (+9% change) with 2.71 million (+4% change). 1.1 demo rating (0% change) with 2.61 million (+8% change). Season averages: 1.09 in the demo with 2.58 million. 1.1 demo rating (-8% change) with 2.41 million (-12% change). 1.2 demo rating (0% change) with 2.75 million (-3% change). Season averages: 1.09 in the demo with 2.59 million. 1.2 demo rating (0% change) with 2.85 million (+6% change). Season averages: 1.08 in the demo with 2.58 million. 1.2 demo rating (+9% change) with 2.68 million (+8% change). Season averages: 1.08 in the demo with 2.56 million. 1.1 demo rating (-21% change) with 2.48 million (-23% change). Season averages: 1.07 in the demo with 2.55 million. 1.4 demo rating (+17% change) with 3.21 million (+13% change). Season averages: 1.06 in the demo with 2.56 million. 1.2 demo rating (-8% change) with 2.85 million (-4% change). Season averages: 1.04 in the demo with 2.51 million. 1.3 demo rating (+18% change) with 2.98 million (+24% change). Season averages: 1.03 in the demo with 2.48 million. 1.1 demo rating (+22% change) with 2.40 million (+6% change). Season averages: 1.00 in the demo with 2.44 million. 0.9 demo rating (-10% change) with 2.27 million (-7% change). Season averages: 0.99 in the demo with 2.44 million. 1.0 demo rating (+11% change) with 2.45 million (+10% change). Season averages: 1.00 in the demo with 2.46 million. 0.9 demo rating (-10% change) with 2.22 million (-9% change). 1.0 demo rating (0% change) with 2.43 million (+7% change). Season averages: 1.01 in the demo with 2.50 million. 1.0 demo rating (+11% change) with 2.27 million (-5% change). Season averages: 1.02 in the demo with 2.51 million. 0.9 demo rating (-10% change) with 2.38 million (+1% change). Season averages: 1.02 in the demo with 2.55 million. 1.0 demo rating (0% change) with 2.36 million (-4% change). Season averages: 1.05 in the demo with 2.60 million. 1.0 demo rating (-9% change) with 2.44 million (-8% change). Season average: 1.07 in the demo with 2.68 million. 1.1 demo rating (0% episode-to-episode change) with 2.66 million (-9% change). Season average: 1.10 in the demo with 2.80 million. 1.1 rating in the 18-49 demographic with 2.93 million total viewers. Season average: 1.10 in the demo with 2.93 million. What do you think? 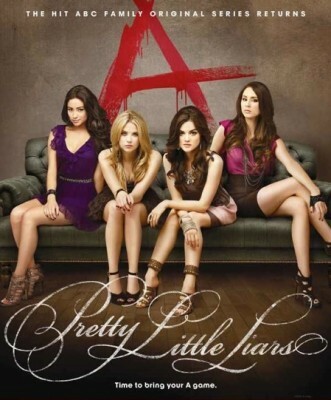 Do you like the Pretty Little Liars TV series? Do you think that it should be cancelled or renewed for a fourth season? Please cancel this god forsaken show. I have seen better acting in a play performed by homeless, talentless children! This list is missing an episode from the summer season. Episode 3×12 was the midseason finale, 3×13 was the Halloween special, and 3×14 was the midseason premier. Thanks for noticing and pointing that out. I found the missing date and adjusted the list. This show is just terrible. I can’t wait til it gets canceled. It probably won’t anytime soon cause it’s got a huge fan base (for some reason). But the plot, writing, acting, everything is just TERRIBLE. Secret Life was WAY better than this crap in the early years. Now it’s gotten bad. But it had way more potential. The ****? Crazy. I LOVE this show. Please, please, PLEASE renew! i highly doubt that pll will be cancelled. it’s abc family’s best show. everyone i know is watching it. if secret life and switched at birth is still going on and no one watches those shows, then pll will be fine. Only reason I want them cancelled is because I want to find out who the other “A”s are. Are the ratings for Pretty Little Liars really good for ABC Family, or are the ratings for Melissa and Joey really bad? Craig » Comparatively, PLL’s are really good. Thanks for the article today listing the ABC Family ratings. That helped a lot to understand how the shows are doing.